NEW FEATURE!!! All of the ‘Ultra-V’ Ultraviolet Sterilizers are available with Standard as well as Waterproof Ballasts. Both feature Intelligent Electronic Design. The ‘Ultra-V’ Ultraviolet Sterilizers are now available and has well been worth the wait. These units features include watertight gasketed housing, hard quartz sleeve, inline lamp replacement, high efficiency remote electronic ballast. And what we feel is the BEST feature of all: The SIZE— under 22″ long. Great for Ponds, Fresh and Marine applications. 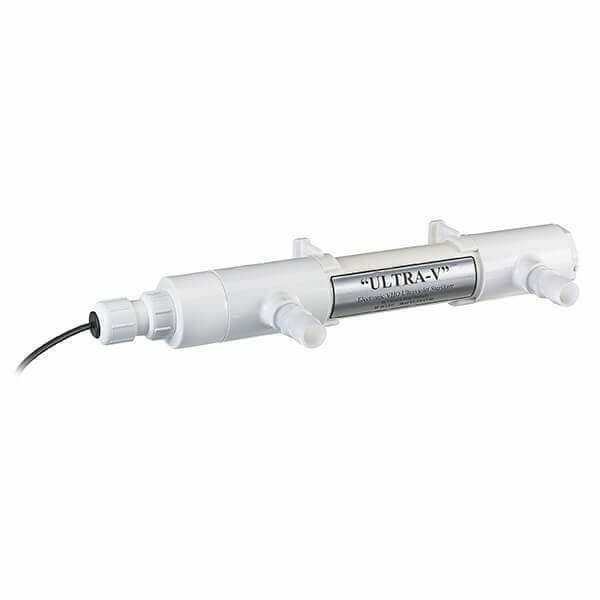 The “Ultra-V” Ultraviolet Sterilizers are excellent choices for Freshwater, Saltwater and Pond applications. These units are watertight and utilize hard quartz sleeves for peak performance. The design also allows for UV lamp replacement without the need to remove the unit from it’s installed position. Allowing for maximum flow rates up to 1500 GPH, these units are designed to be used with your favorite water pumps. By changing the flow rate through the UV unit, you will change the active “Power” of the UV unit. The “Ultra-V” is made in the USA and has a 1-year warranty on the Unit and Ballast, and 30 days on the UV Lamp and Quartz Sleeve.